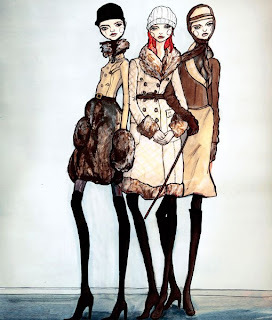 PONY RYDER: INTERVIEW WITH FASHION ILLUSTRATOR DANIEL ROBERTS! 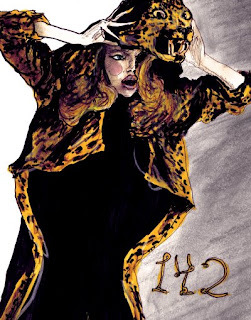 INTERVIEW WITH FASHION ILLUSTRATOR DANIEL ROBERTS! 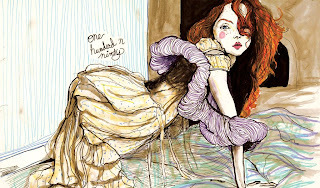 PONY RYDER is presenting a Fashion Illustrator Daniel Jonathan Roberts a.k.a. Danny, a face behind fantastic art blog where you can see all of his illustrations: igorandandre.blogspot.com. 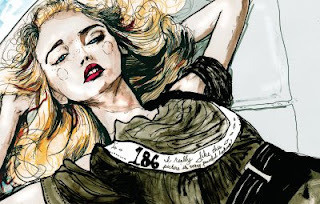 DANNY ROBERTS: I've liked to draw my whole life, but wasn't any good. it wasn't till 3 years ago that i committed to drawing every day and my drawings started improving. PONY RYDER: How did your career as an illustrator begin? DANNY ROBERTS: It's kinda funny how it started. I started at the Academy of Art University, majoring in Fashion Design, and the first class i took was fashion illustration 1. I fell in love with doing fashion illustrations and decided then that i didn't want to be a designer, but an illustrator. PONY RYDER: Did you go to any kind of school for drawing or something similar? 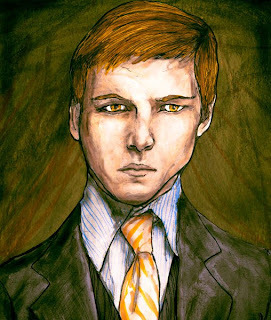 DANNY ROBERTS: Yes. My first year of college my major was in photography, but then i ended up leaving that college and transferring to The Academy of Art University, where i majored in fashion design and then ended up concentrating in fashion Illustration. PONY RYDER: Is illustration the only type of art that you do? DANNY ROBERTS: No. I like to do just about every type of art. i have a backround in photography, and i like to do a lot of digital imaging. Also, when i have time i like to write music, and write stories and poems. PONY RYDER: Why did you choose fashion as a focus of your work? DANNY ROBERTS: There are a few reasons. First one is, i love drawing clothes and the challenge of drawing drapes. Also, i was studying to be a fashion designer when i first learned how to draw so drawing fashion/ figures feels really natural to me. PONY RYDER: Do you see fashion as a bridge between art and commercial? DANNY ROBERTS: hmmm... that's an interesting question. I've never thought of it that way. i guess it could be. 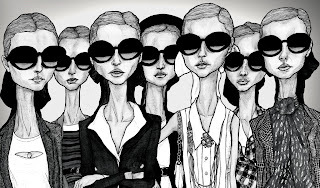 PONY RYDER: Can you name us some of the fashion projects you worked on, that you are specially proud of? 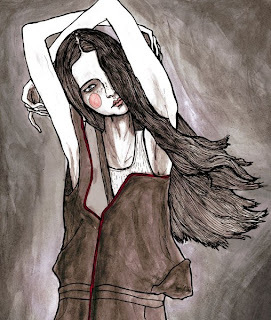 DANNY ROBERTS: Last year, i was asked to Illustrate the Look book for Academy of Art Senior show at New York Fashion week. That was my first job and it was a great learning experience for me.Also, i'm not sure if this constitutes as a fashion project, but my character sketchbook, that is probably one of my most personal projects and the one i think i'm most proud of. PONY RYDER: What technique and materials do you use? 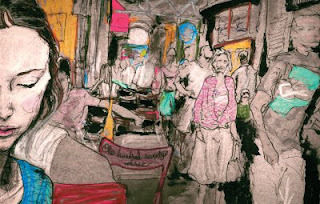 DANNY ROBERTS: For techniques, i almost always draw using blind contour cheating a little, which basically means, i try to look at my paper as little as i can, and keep my eye on whatever i'm drawing. I like drawing this way cause it keep my line true. i like using a lot of mix media, but fine tip pens like micron pens are my favorites. Also, water down ink or Gouache. PONY RYDER: What advice would you share with someone who is just entering the world of illustration, and is trying to create a work of his own? DANNY ROBERTS: I would say be true to yourself and enjoy it. It can be hard and frustrating trying to break in to the illustration world. i think the key is motivation. if your motivation isn't on "Making it", i think you will get burned out, but if it's on having fun and enjoying what you do, i don't think you can ever get burned out. PONY RYDER: In Vol.I and Vol.II of your sketches the themes you use are Lilly Cole and Gemma Ward. Why did you choose them? Are there some other modells that inspire you? DANNY ROBERTS: ha ha ha yea. It is kinda random how i ended up drawing them, but they looked like just like girls i drew right when i first started drawing. 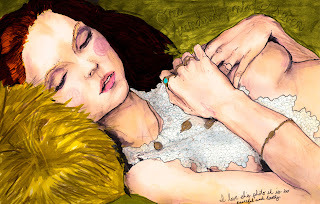 i didn't know who Lily Cole or Gemma Ward were and then one day my first year of college, i saw a picture of Gemma and i froze, cause she looked just like my drawings. 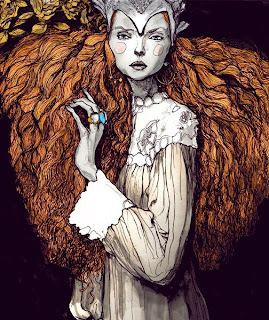 The same thing was true with Lily Cole; it was like seeing my drawings come to life. i started the Lily and Gemma book to practice and refine my drawing skills by drawing just those two girls over a long period. It was kind of like a science project; i choose just two people to cut down on the variables. I thought it only seemed right to draw them, because their look complemented my drawing style. 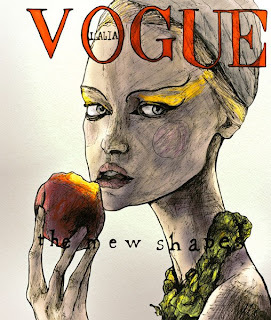 ..
DANNY ROBERTS: Yes, there are a handful of other models that inspire me, and i'm always on the lookout for new models. I like to draw Sophie Ward alot; she has a beautiful long graceful look to her, and she also has the coolest hands i've ever seen! Also, i love the looks of Jessica Stam and Heather Marks, and though i haven't drawn her much, i think Mona Johannesson has a great innocent look. 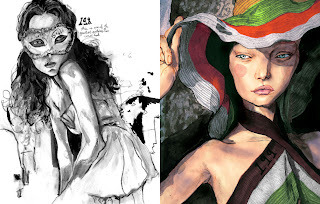 PONY RYDER: Do you see a possibility that illustrations start regullary appearing next to photo editorials in fashion magazines? DANNY ROBERTS: That is definitely one of my goals. It is sad to me that Fashion Illustration has died off as much as it has, considering that illustration is the earliest form of "photo editorials".i think it's very likely illustration can make a come back. PONY RYDER: Can you give us a preview of your work that we are very excited to see in the future? DANNY ROBERTS: I've have a few things in the works right now. I'm currently finishing up illustrating my first children's book, writen by Sophie Ward, and i'm also finishing up Volume 2 of the Lily and Gemma book. In addition, i've begun planning this Collaboration project with Sophie Ward and muscian Stacy Dupree from the band Eisley. Danny Roberts will soon set up his online store, but before he does be sure to check out his portfolio and vote for the images You like! Outgoing as he is, he is also planning to air the video of drawing development so for all illustration lovers, go and see... That kind of a lesson does not happen on daily basis! Danny says Hi to Pony Ryder! Pony HI-s back! This is a genuine interview done by Pony Ryder for Pony Ryder Original Q and A section!